Committed to helping in the fight against hunger, online store bonhappi-T.com has facilitated the provision of over 32 000 meals for the less fortunate through the sale of their t-shirts. Bonhappi-T, the brainchild of Susan Wright and Felix Schmitz was launched in August 2016 with the aim of selling the funkiest t-shirts to help raise funds for FoodForward SA. Bonhappi-T had the pleasure of working with street artist Giffy Duminy, a self-taught artist from Durban. 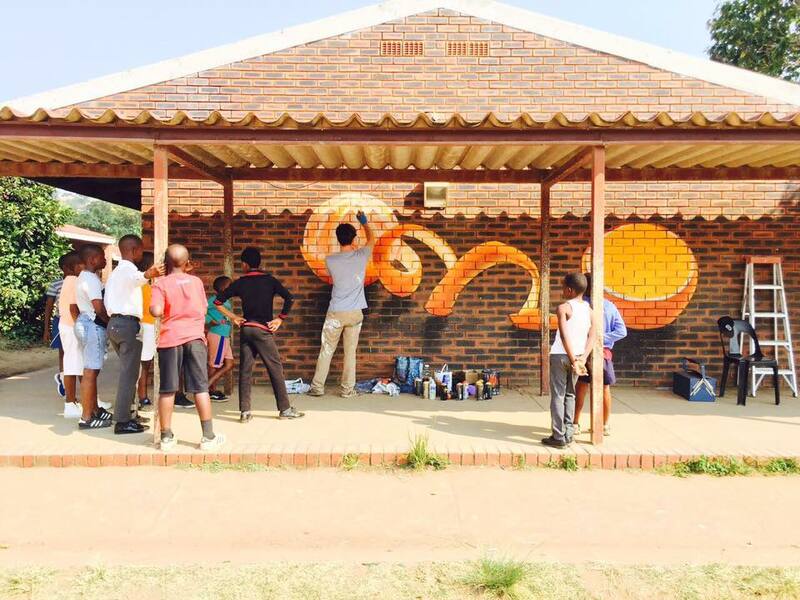 Giffy painted a beautiful mural at Zwakele Primary School in KwaZulu-Natal which will be used as artwork in the up and coming bonhappi-T artists range. “It was incredible to see how he managed to transform an old and lifeless space into something that had a school of over 1000 young learners totally mesmerized”, said Susan. At only 24 years old, this young man is bound to transform many more dull surfaces into bright and happy spaces. Giffy started painting graffiti in high school where he found a love for the arts in 2010. In recent years he has painted hundreds of nature subjects to inspire appreciation for our natural environment. “Painting positive murals in the public space unites people like nothing else. It creates a platform for all to appreciate and to connect with their surroundings on a personal level”, says Giffy. Partnering with Giffy is just one of the great initiatives by bonhappi-T. It brings them great joy knowing that they can give back to the community and support those who need a helping hand. FoodForward SA is grateful to have socially conscious partners such as bonhappi-T who share a common goal of enriching the lives of disadvantaged South Africans. A lot has been accomplished throughout the partnership and has many South Africans benefiting from its initiatives. If you would like to purchase a bonhappi-T t-shirt and support FoodForward SA, you can visit www.bonhappi-T.com. Join the Fashion for Food happiness movement and receive 5% off your first purchase.